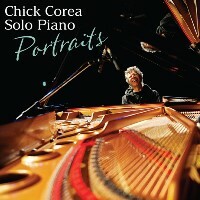 Description: Recorded live on a world tour, Solo Piano - Portraits brings an intimate concert experience to the listener. A large and varied assortment of solo piano titles include jazz standards, classical music, Corea's original compositions, and what he calls "portraits." He invites people one by one up on the stage, and has them sit with him and he will study their vibe/aura, and then plays their aura on the piano. These 2CD set also contains his monologues--or more precisely conversations with the audience--about the composers he has admired over the years and is focusing on right now (Bill Evans, Stevie Wonder, Thelonious Monk, Bud Powell, Scriabin, and Bartok). The Japan-only SHM-CD edition delivers this unique concert experience (over 2 hours of music!) with exceptional sound quality. Strongly recommended for fans of Chick Corea and piano music! Recorded live at various locations including Lithuania, Morocco, Poland and Easton, Maryland. This SHM-CD edition released in Japan in 2014. 2. Improv #1 / How Deep Is the Ocean?